Government has released the findings of the fourth Wave of the National Income Dynamic Study (NIDS), which profiles what is happening with South Africans across the income spectrum. The NIDS provides information about the same set of households across time from wave 1 in 2008 to wave 4 in 2014/15. The study is undertaken at two to three year intervals, with the first or the base wave undertaken in 2008. The study defined middle class by using a monthly per capita expenditure range of R2,920 to R10,678, based on January 2015 prices. Using this threshold, the middle class in South Africa is only about 15% of the total population. There has, however, been considerable demographic transformation within that band of the middle class, with Africans now outnumbering whites by about two to one, the report said. The Global Wealth Report 2015, published by Credit Suisse, found that middle class South Africans accounted for 13.7% of the adult population in the country, while middle class and above adults make up nearly 15% (14.8%). This is in contrast to countries like Brazil, where only 8.1% of the population are middle class, Russia, with 4.1%, Egypt (5%), and India with 3%. Australia has the highest percentage of its population, 66%, classified as middle class, followed by Singapore, and Belgium with 62%. As many as 80.3% of Australians are seen as middle class or above. Credit Suisse defines the middle-class in terms of a wealth band instead of an income range and uses the US as the benchmark country where a middle-class adult is defined as having wealth between $50,000 and $500,000 valued at mid-2015 prices. As few as 38% of adults in the United States qualify as middle class according to Credit Suisse’s criteria. According to a Standard Bank report, using data compiled by the Bureau of Market Research (BMR), the middle class in SA comprises 18% of the working age population. 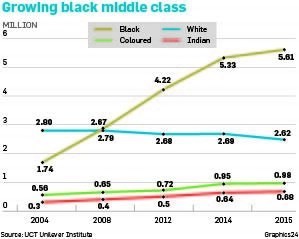 In terms of South Africa’s rising black middle class, updated figures showed that this segment has more than trebled over the past 12 years, while the country’s white middle class has shrunk over the same period. 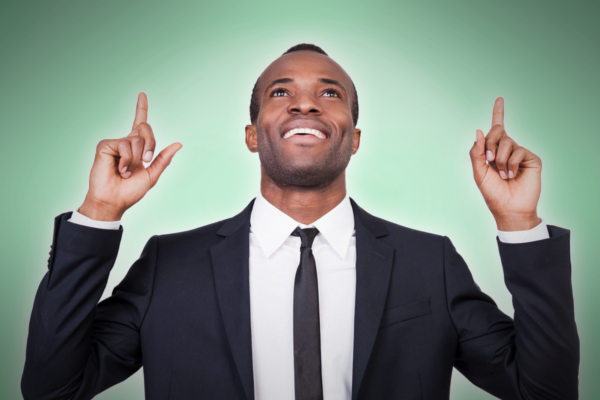 City Press reported that the black middle class is up to 5.81 million, citing University of Cape Town marketing professor, John Simpson. The NIDS is a national research resource undertaken in partnership with the Southern African Labour and Development Research Unit (SALDRU) at the University of Cape Town (UCT) as the implementing agency.